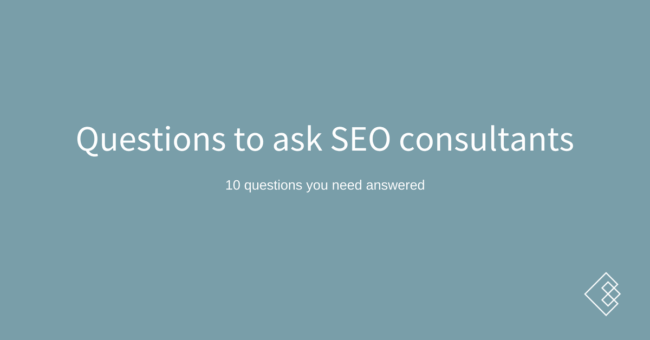 If you’ve never hired an SEO consultant or SEO agency before, you likely don’t know where to start. What are some of the strategies and tactics you have seen working well recently for a business like mine? Can you give me some examples of working with a site like mine? How often do you report on the work you are doing, and how can I know if it is successful? How does an engagement with you typically start, and what do you require from me? What’s your approach to link building? Do you have a minimum project engagement length? If approached, would you work with my direct competitors as clients? How long does SEO usually take to start working after someone begins working with you, and what level of effort is required? Who will I speak with on a regular basis? Why you ask it: You want to know if they are trying new things and up to date with what is actually driving business results, as opposed to reading with the “gurus” are saying. You want real experiences, real stories, about how things have shifted and what is driving results for their clients. Why you ask it: SEO is super complicated these days and what works for large sites won’t work for small sites, and vice versa. As SEO becomes increasingly specialized, you want to work with someone who has extensive experience working with your type and size of website. They’ll understand your audience, how to target them, how to fix your website, and so much more. Why you ask it: different businesses report in different ways. Sometimes your reporting is light and your VP of marketing understands that SEO is a long term commitment and therefore they need less reporting (and upward management) than a VP who expects SEO to work like PPC (I give you $X dollars and you give me back $Y dollars). Regardless of if your business is the former or the latter, you need to hire the agency or consultant who reports (or is able to report) in the ways that you require. Why you ask it: from an agency/consultant perspective, the project kick off is one of the most crucial parts of the whole engagement. As the business hiring a consultant/agency, your understanding (and their ability to communicate it) of what is required from your end for a successful project (eg access to Analytics/Search Console/revenue data/etc) can make or break the project from the beginning, or severely hamper its effectiveness at minimum for a while and quite likely forever. They should give you a list of all the things they require access to and what you need to do to help them be successful in growing your business. Why you ask it: if you’re hiring an agency/consultant to build links to your site to help with your organic traffic, you first need to educate yourself about the good, the bad, and the ugly of link building. Then, you need to ask your potential marketing provider how they build links to your site, what they will prioritize, and how you should measure their success (hint: it’s complicated). If you have any doubts, get a second opinion or walk away. It’s not worth your business. Why you ask it: this question is key to ask during the first conversation so that you know what to expect when they send you a proposal for services/strategy. I cannot tell you the number of times I have seen a business be caught by surprise that the agency/consultant has a 12 month minimum for projects. While I understand it from the agency/consultant side (it takes time to see results, monthly recurring revenue is how to build a successful agency), from the business side signing a 12 month engagement with an unproven agency is very scary. While we definitely encourage you to look at an engagement as an investment rather than just a transaction, and to ask them for other clients they can speak with, you should know your limits as far as committing. Most agencies should be willing to do an initial three month engagement then go month to month, as long as expectations are set well. Why you ask it: Some providers will work with a client’s direct competitor, but this is not always a deal breaker. Thus, ask the question to see how they would handle this situation, and if they work with competitors then give them a chance to explain their reasoning as well as how working with your competitor would also not affect your own project’s success. Sometimes agencies have ways of managing competitors internally so that work is genuinely done by different account managers and delivery teams, so always ask the question as it can also tell you a lot more about the agency and their internal structure. Why you ask it: There are two reasons for this question – first to set your own expectations for how long your investment in working with a marketing provider will take to see initial positive results, and second to realize that you are delegating marketing work not abdicating it to someone else. At the end of the day, the business and its results are still your responsibility. Over my last eight years of working in SEO, it has become increasingly complicated to execute on great work and the time required to see results has increased dramatically. Any good SEO agency/consultant will be able to tell you about other clients they’ve worked with and how long it took to see results that matter to the business (not just traffic increases!). Why you ask it: If you’re working with a solo consultant, you can be quite confident that you will have calls directly with the consultant and that the consultant is the one doing the work (though you should ask about this as some consultants use contractors for certain work). When speaking with agencies about them doing work for you, there is a good chance that they have an account management layer where the account manager is the primary one responsible for delivering the work, sending reporting updates, and more. You should ask further questions to feel out the level of communication each client receives and then decide if you are comfortable with that. For example, ask questions around how many clients each account manager manages, if you are able to communicate directly with the people doing the actual work if needed, and so on. Why you ask it: One of the biggest challenges I see to a marketing project agreement being signed between a provider and a business is cost. Of course cost is important when hiring an agency/consultant because each business has different budgets available, different services they need, and different potentials for growth. Because of this, pricing work can be very difficult. Too many times I’ve seen a business have great conversations with a consultant or agency only to then have sticker shock when they receive a proposal. “$5,000 a month for 12 months minimum? ?” This isn’t an uncommon thing for me to hear, but it can be alleviated! Discussing money is awkward for many. Maybe I grew up in a weird family, but we’ve never shied away from discussing money. I know exactly how much each person in my family makes. I’m pretty public with my business’s revenue too. But I understand that most are not. If you are not comfortable discussing pricing, there are a few ways to get better at it. Opening up this conversation is a great way to start building trust with them, being seen as a partner not a paycheck, and also to avoid that sticker shock. If you’re looking to hire an SEO consultant or agency, we want to help you define that project. Create your project here and we’ll follow up with you!